Consider a charged non conducting solid sphere of uniform charge density, and it as hole of some radius at the centre. Now suppose I apply Gauss law. As there is no charge inside the cavity, no charge is enclosed by Gaussian sphere, so electric flux is zero, hence electric field is zero. But this is not true according to sources like this, textbook etc.. Thus the flux is zero by explicit calculation as well. Remember that the electric field and area are vectors. So the relative directions are very important. If flux is zero all you can be sure of is that the extent of field lines entering is equal to that of exiting. Gauss's Law only gives results for the integral over a whole, closed surface. This does not mean the electric field is zero. It simply means that all field lines entering the volume also exit it at some other point. In the video the electric field lines are as shown in blue in the diagram below. Let the edge of the cavity be the Gaussian surface which has no charge within it. Consider small areas $\Delta A$ on either side of the cavity as shown in the diagram in red. 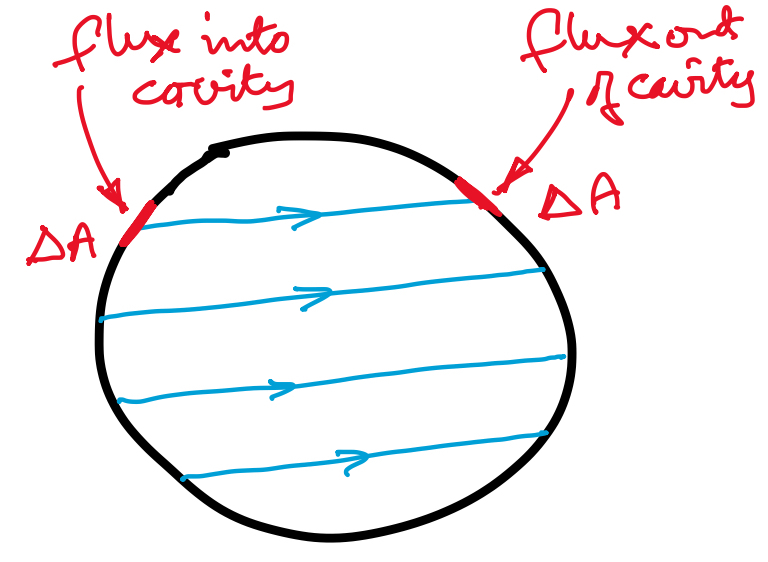 Because of the symmetrical nature of the situation you can imagine that the electric flux entering the cavity through area $\Delta A$ is the same as the electric flux leaving the area $\Delta A$ on the right hand side. This means that the net flux through those two surfaces is zero. Doing the same for the whole Gaussian surface leads to the result that the net flux though the surface is zero commensurate with the fact that there is no charge within the surface. The field of a uniformly charged shell is zero inside the shell in agreement with Gauss's law, unless there is an external field. A uniformly charged sphere with a concentric spherical cavity is a concentric sum of such shells, so the field in the cavity vanishes. Not the answer you're looking for? Browse other questions tagged electrostatics electric-fields charge gauss-law or ask your own question. Electric Field from charged sphere within another charged sphere does not reinforce? What is the electric field intensity inside a conducting sphere when charges are asymetrically distributed over the surface? For a point charge enclosed by a thin spherical conducting shell, at all points in hollow part of resulting sphere, can electric field be non-zero? Why is the electric field inside the hole non-zero? Are charges outside a conducting shell relevant to electric field inside the shell?